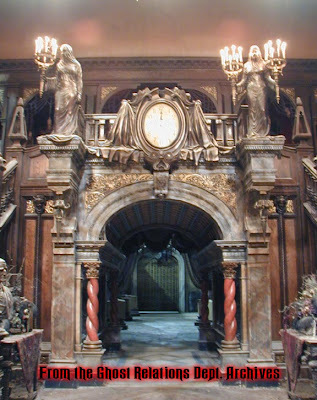 For the Haunted Mansion Movie, there was a great concept created for many of the set pieces seen. For some sets, The Ballroom, The Library and the Foyer, there were two versions of the same set. There was the normal version, and then the Haunted version. Even the exterior had some plans of being less haunted than what we saw in the movie. 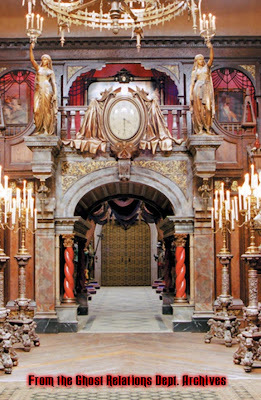 In example here, there are two photos of the Foyer set. The before features brighter colors and more decoration, it also features the normal versions of the changing portraits (later to be put into a new set). One of the key features of this set are the two statues that adorn the clock over the entrance of the Armory. The normal versions, which were rented from a Hollywood prop house feature two women with their candleabras held high. The after versions (created by the studio), feature the women as shrouded figures, no longer holding their lights high. These styles of hooded/shrouded figures are found in many places in the movie. Weird that the "haunted" version also gives one of the statues another whole candelabra.